Spring & Summer are coming, so are hot days. But with hot days comes the threat of heat stroke and heat related illness. These conditions occur when the body’s temperature control system is overloaded. The body normally cools itself by sweating, but sometimes that isn’t enough. When this happens, the body temperature goes up rapidly and can damage the brain or other vital organs. Many things affect the body’s ability to cool itself down including high humidity, age, obesity, fever, dehydration, prescription drug and alcohol use, heart disease, mental illness, poor circulation and sunburn. 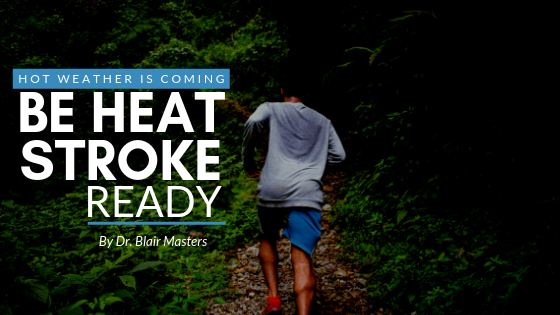 Heat stroke is the most serious heat-related illness and occurs when the body’s temperature rises rapidly, the sweating mechanism fails and the body is unable to cool down. Within 10 to 15 minutes, the body’s temperature may rise to 106 degrees or higher. Heat stroke can cause permanent disability or death if emergency treatment is not provided. . If someone should experience a heat stroke, in addition to calling for immediate medical assistance, you should cool the affected person rapidly by moving them to a shady area or immersing them in a tub of cool water. If the humidity is low, wrap them in a cool, wet sheet and fan them vigorously. Monitor their body temperature until it drops to 101-102 degrees and if emergency medical personnel are delayed, call the hospital emergency room for further instructions. The key to avoiding heat stroke is prevention, and sitting in an air-conditioned location is a good start. Electric fans may also provide comfort. Other prevention techniques include drinking plenty of fluids, replacing salts and minerals, and wearing appropriate clothing and sunscreen. We have a great trace mineral supplement in the office that I recommend taking regularly during the hot days of summer. What Puts Youth Athletes At Risk? This time of year a lot of young athletes participate in sports during the hot weather. This makes them particularly vulnerable to heat related illness. Children absorb more heat from a hot environment because they have a greater surface-area-to-body-mass ratio than adults. The smaller the child the faster he heats up. Children and adolescents may have a reduced ability to dissipate heat through sweating. Children and adolescents frequently do not have the physiological drive to drink enough fluids to replenish sweat losses during prolonged exercise. Young athletes may be more easily distracted when occasions allow for them to rest and rehydrate. Stay hydrated and stay healthy. If you are concerned about heat illness, come by the office and there are some quick easy tests we can do to see if you are doing all you can to prevent this deadly health problem. Call us at 479-443-0800.